Scroll Down to See Your 2018 Fast Pitch Winners! What Is A Fast Pitch? Budding and Seasoned ENTREPRENEURS from the Six County Region are invited to pitch their Business Concepts and Product Ideas to a group of judges from the business, investment, and entertainment community. The presentation is made to judges during individual, confidential sessions for a chance to win cash, prizes, advertising, and professional small business consultation designed to turn the idea into reality. Eligible participants will have five (5) minutes to set up, five (5) minutes to “pitch” a business idea that could be developed in the one of the participating counties, and five (5) additional minutes to field questions from our judges. 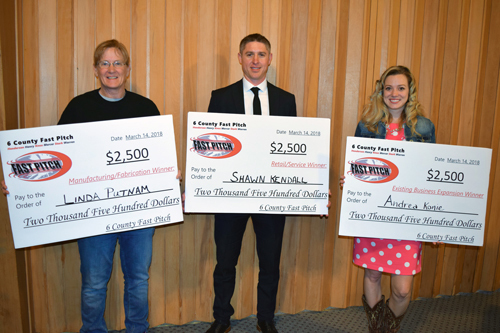 On Wednesday, March 14th, entrepreneurs competed in the 6 County Fast Pitch Contest vying for cash and prizes to help turn their idea into a new or expanding business in the counties of Henderson, Henry, Knox, Mercer, Stark and Warren Counties in Illinois. The 20 entrepreneurs presented their ideas to a panel of judges during confidential, individual, 10 minute “fast pitch” sessions. They competed in three different categories: Existing Business Expansion, Manufacturing/Fabrication and Retail/Service. At 2pm the winners were announced during an awards ceremony at the Alpha United Methodist Church. 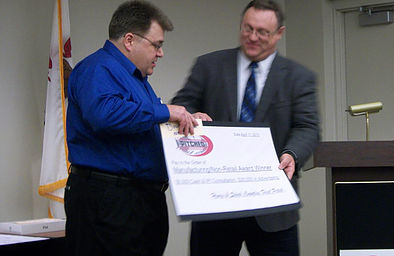 The grand prize winner in each category was awarded $2,500 cash, up to $35,000 in media advertising donated by Regional Media, Gatehouse, Galesburg Radio, and WRMJ radio; $1,800 marketing consultation donated by Dave Dunn’s Masters Educational Services; up to 8 hours of customer service training from University of Illinois Extension, a $500 Scholarship to related coursework at either Carl Sandburg College, Blackhawk College, or Blackhawk East from their Foundations, accounting services donated by Thomas L. Irons, EA Accounting Systems, Inc, and continued consultation and support from Western Illinois University’s Small Business Development Center. Manufacturing/Fabrication/Distribution – Andrea Konie for her business Dinners On Me. Her business is based out of Cambridge in Henry County. Existing Business Expansion – Linda Putnam for her business Linda’s Salsa. Her business is based out of Monmouth in Warren County. Retail/Services – Shawn Kendall – Trademark Vacations for his potential business. His business is based out of Galva in Henry County. A panel of 9 judges listened to the contestants give their pitches and determined the winner. Judges included: Gary Camarano, Director of the Whiteside County Economic Development Department, Annette Ernst, Village Administrator, Coal Valley, IL, Kevin Evans, Director- Illinois Small Business Development Center at Bradley University, Julie Forsythe, Vice President, Entrepreneurship and Innovation, Quad Cities Chamber of Commerce, Salvador “Sal” Garza, Manager, Illinois Department of Commerce and Economic Opportunity in the Office of Regional Economic Development, Galesburg, IL, Anne Heinze Silvis Assistant Dean and Program Leader, Community and Economic Development, University of Illinois Extension, Janice McCoy, County Director, University of Illinois Extension, Carroll, Lee and Whiteside Counties, Sean Park, Program Manager for Value Added Sustainable Development Center, Illinois Cooperative Development Center, Illinois Wind Access Center and Business Advisor for the Small Business Development Center at Western Illinois University, and Keith Williams, Coordinator of Business Programs, and Instructor of Economics and Business Administration at Carl Sandburg College. The 2018 prize sponsors of the 6 County Fast Pitch included: Accounting Systems, Inc., Black Hawk College East Foundation, Black Hawk College Quad Cities Foundation, Carl Sandburg College Foundation, City of Galva, First Mid-Illinois Bank & Trust, Galesburg Radio, Gatehouse Media, Masters Educational Services, Office Specialists, Inc., Regional Media, University of Illinois Extension, Western Illinois University’s Small Business Development Center, and WRMJ Radio. Organizations who planned the event included: City of Aledo, City of Galva, Carl Sandburg College, First Mid-Illinois Bank & Trust, Galesburg Chamber of Commerce, Illinois Small Business Development Center at Western Illinois University, Kewanee Economic Development Corporation, Knox County Partnership for Economic Development, Mercer County Better Together, University of Illinois Extension, and Western Illinois Works, Inc. 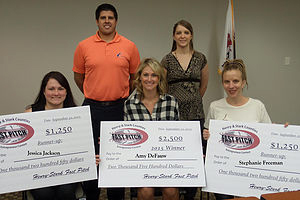 Winners of the 2015 Henry and Stark Counties Fast Pitch: (from left front) Runner up: Jessica Jackson, Spoon River Design, Toulon, IL; Grand Prize: Amy DeFauw, Katsch, Geneseo, IL; Runner Up: Stephanie Freeman, The Butter Churn, Woodhull; (back row) Marketing Winner: Chris Colomer, Flex-Court, Kewanee, IL; Judge’s Award: Jennifer Douglas, Jennifer’s Yoga Journey, Atkinson, IL. *All decisions of the Fast Pitch Committee are FINAL!